*Disclosure- I received a copy of the book from the publisher via FlyBy Promotions in exchange for my honest thoughts. I was not required to write a positive review and all opinions state are 100% my own. families grasp the totality of God’s perfect grace. As soon as this book arrived at the house, all three of my kids were itching to read it. The cover is full of vibrantly colored things that relate to Easter that really caught their little eyes. As we read the story, my six year old daughter began asking me tons of questions about the story and about Sam not being honest with his parents and why. This book definitely opens the story to teach children not only about forgiveness and redemption, but about the resurrection of Jesus Christ in a way that they can understand. I think even as an adult, it is a good book to remind us that we all mess up, we all have faults, but because of Jesus' sacrifice on the cross, it isn't our burden to bare. We should still try to be the best people we can be, but when we mess up, we confess our sins and accept God's redemption. We have read this book several times since we received it and the first few times I could barely get through the entire thing without tearing up. I think a sparkle egg is a great tradition to start and a great representation of the resurrection of Jesus. My 4 year old boys enjoyed this book too and asked a lot of questions about the story, but do not have quite the grasp on the concept that my 6 year old did. I think it is worth beginning to read to early learners as well as school aged children. Kids are so often told what they should be doing right that sometimes when they mess up, they feel like failures. The Sparkle Egg is a wonderful reminder that nobody is perfect and that we are all the same in God's eyes. This is absolutely a book you want to add to your child's home library! About the author- Jill Hardie’s first book, The Sparkle Box, ignited a new Christmas tradition that helps center Christmas in the true joy of the season. Now Jill is hoping to touch lives with a new Easter tradition with The Sparkle Egg. She lives in North Canton, Ohio. Check out my review of The Sparkle Box here. About the illustrator- Christine Kornacki illustrated the highly acclaimed The Sparkle Box. She has a love for painting and a knack for bringing stories to life. Christine received a BFA in illustration from the University of Hartford and spends most days painting in her studio, which adjoins a charming café in New Haven, Connecticut. 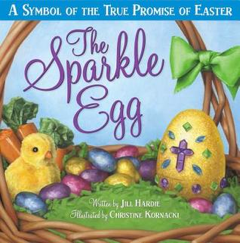 You can get your own copy of The Sparkle Egg at Idealsbooks.com, Amazon.com or at Christian retailers nationwide! Connect with Ideals Books on Facebook. The awesome people from Ideals Books want to give one lucky reader a copy of The Sparkle Egg. Enter below via the Rafflecopter for your chance to win! It would be awesome to see a book geared towards 6-8 year olds that touches on different family dynamics such as adoption, single father, single mother, grandparents raising a child, foster care etc.! Majestical Jewelry Review & Giveaway!